How would you like a chance to win a trip around the world? 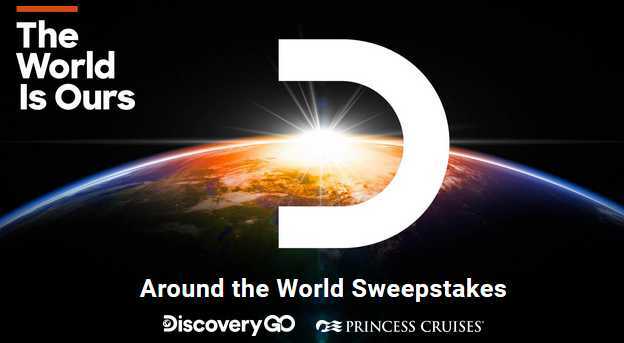 Enter into the Discovery Channel Around the World Sweepstakes now through April 15, 2019 for your chance to win 49-day trip around the world for two people. How To Enter: During the Sweepstakes period download the Discovery Go App on your device or go to their website at Discovery.com and then watch Discovery shows for the daily Around the World Sweepstakes Code, and once you know the code word now go to this link:www.discovery.com/aroundtheworld and follow the online instructions to register by entering all information requested on the registration form and once you filled out the entry form including entering correct code word. Prize(s): There will be one grand prize winner in this Sweepstakes who could receive win 49-day trip around the world for two people. Trip Includes: round-trip coach class airfare, two (2) tickets aboard various Princess Cruise Line ships for a forty-nine (49) day trip around the world, including: Brisbane, Indonesia, Singapore, Sri Lanka, Oman, Dubai, Jordan, Egypt, Greece, Croatia, Malta, Venice, Rome, Cannes, Barcelona, Morocco, Portugal, Ireland and London; (iii) $1,000 spending money; and (iv) transfers to/from airport. Total ARV of all Grand Prize is: $31,000.!! Who Can Enter: Open only to legal residents of the 8 Contiguous United States and District of Columbia who have reached the age of 21 years old at the time of entry. When To Enter: This sweepstakes entry begins at 9:00 a.m. Eastern Time (“ET”) on April 1, 2019, and all entries must be received by 11:30 p.m. ET on April 15, 2019. Who’s Sponsor: The Sponsor of this Sweepstakes is Discovery Communications, LLC One Discovery Place, Silver Spring, Maryland 20910.